← What’s Going On In Israel About Stuttering? 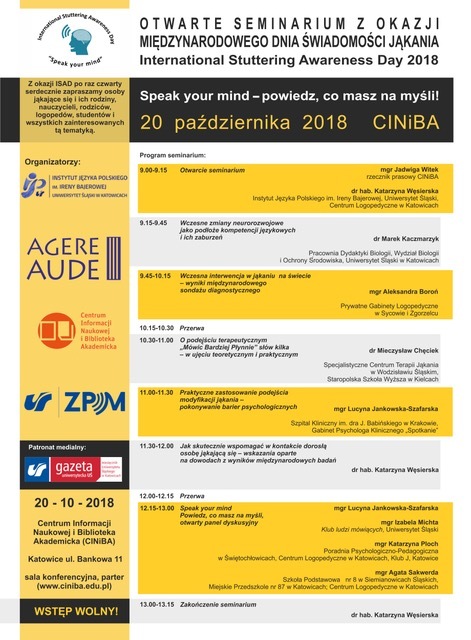 An open seminar ‘Speak your mind’ will be held in the Scientific Information Center and the Academy Library (CINiBA: www.ciniba.edu.pl) in Katowice on Saturday October 20th. The aim of this event is to achieve a better understanding of stuttering and to continue changing social attitudes towards it. The seminar is addressed not only to persons who stutter but to everyone interested in stuttering, especially to teachers and parents of stuttering children. The seminar is an opportunity to exchange ideas on how to effectively support a pupil who stutters and, as a bonus, how to improve communication in his school environment. Fluency specialists – speech-language pathologists and psychologists will be present at this event to share their knowledge and experiences. Alongside these professionals, a neurobiologist will present on early neurodevelopmental changes as a basis for language skills and their disorders. Accompanying the event will be an open discussion panel with persons who stutter and fluency experts (SLPs, psychologists, leaders of self-help groups for stuttering). 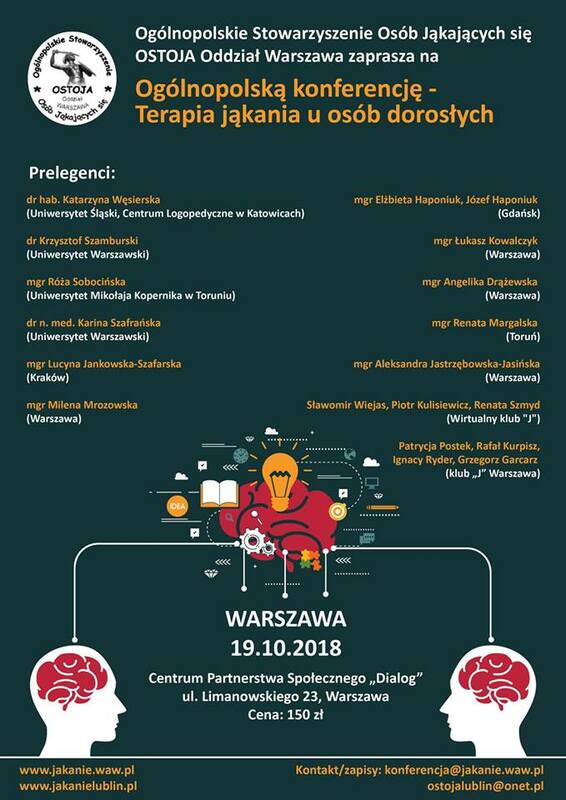 What is more, between the 18th and 21st of October the Annual Convention of the Polish Stuttering Association will be held in Warsaw. Numerous events have been organized for this occasion, such as a conference, workshops, a discussion forum and a ball for the participants of the convention. 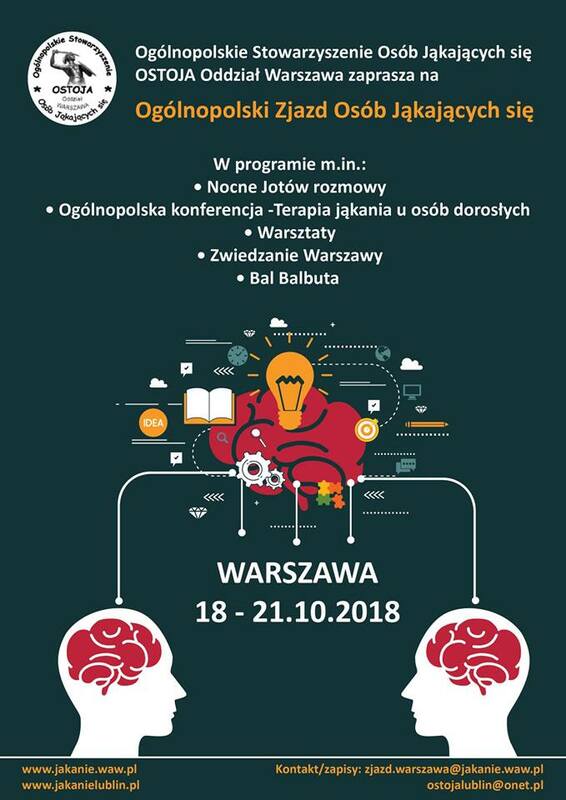 The conference will be an integral part of the convention during which various specialists – speech-language pathologists, researchers, SLP-clinicians and leaders of the self-help movement in Poland will share their ideas and experiences. ISAD 2018 in Poland promises to be very interesting – welcome! So happy to read about the activities in Poland. I had the pleasure to have been to Poland on several (mostly stuttering) occasions and met great pws and slps. 🙂 As a pws who didn’t know there were others who stutter until I was 27, I thank you from the bottom of my heart for the life changing work you do. I myself speak to students and teachers in school and have been a children and youth camp leader for almost 30 years, and to see children AND PARENTS feeling understood and proud is so rewarding! It’s not all about fluency. It’s about getting them to speak their mind.